Gorgeous “Good Mother Stallard” beans and little purple potatoes with swirls of E.V.O.O. Well, let’s just say that we got past all of the where have I been and what I have I done and we are conversant again. I continue to throw flour around the kitchen, make frequent delicious messes, and enjoy cooking, but my life has swelled quite a bit over the last few months to the point that it is bona fide full. I love writing here and hearing from those of you who read, however, so I will again endeavor to get back on the Ciccia train. 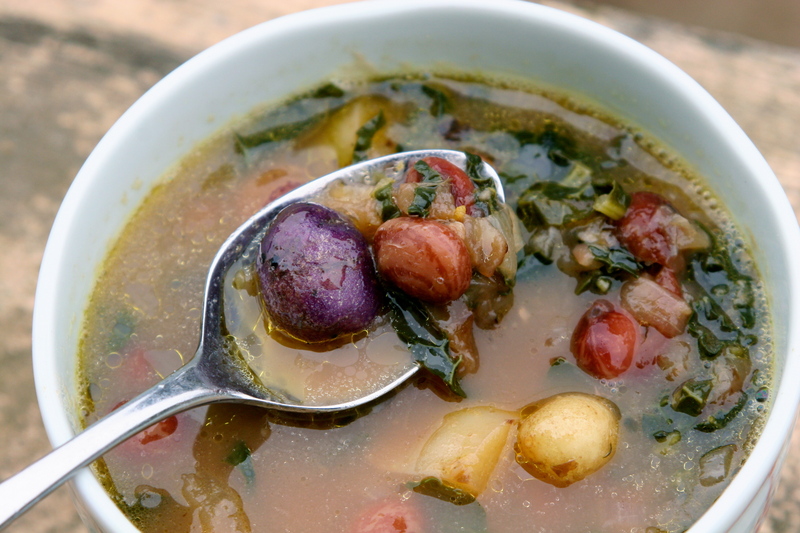 “What began as a way to use up all of the Kale-Gone-Wild from our garden several years ago evolved into what is hands down the household favorite soup. Sure, there are subtle variations in the potatoes or the allium mixture, but the basic ingredients and technique do not waiver. 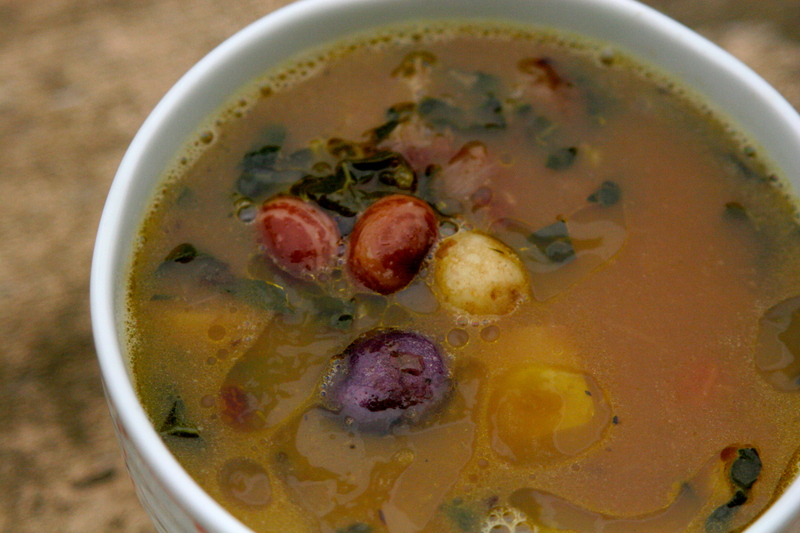 Crucial to making this soup, since the ingredients are so simple, is idyllic produce and technique. And more homemade bread wouldn’t hurt either. Last week I used the last dinky summer potatoes. I grew six varieties this year, but my location was a good deal shadier than last years’ so I had neither large potatoes nor an abundance of them. The good news is that I had oodles of lovely, marble-sized, tasty fingerling potatoes and ended up tossing them in this rendition of our soup. Purple Peruvians looked particularly stunning next to my favorite Rose Apple Finns. Kale? Check. We always have kale growing. My six year old adores it. Onions and garlic. Broth of choice. Extra virgin olive oil. Tender beans that hold their form, but give way to a soft sumptuous middle (our two favorites are currently either Rancho Gordo’s Good Mother Stallard beans or the Yellow Eyes). One Meyer Lemon. Pecorino Romano Cheese. 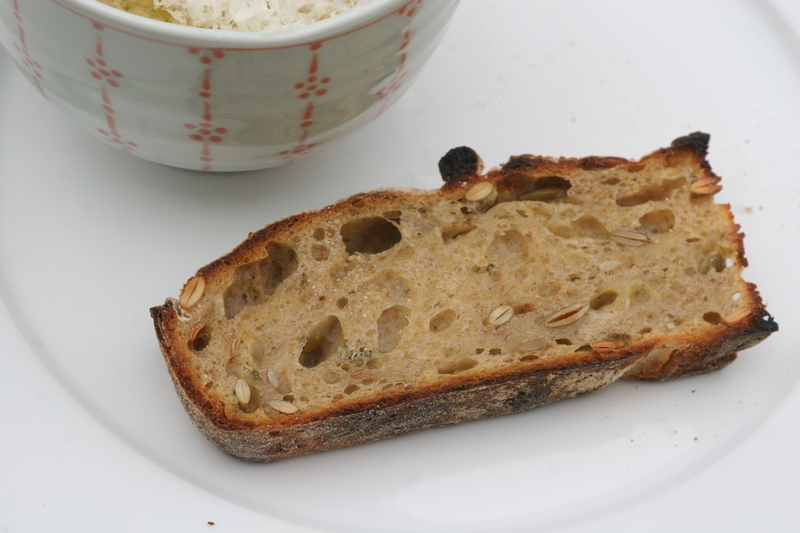 As with most of my favorite recipes, this one is really the sum of its marvelously simple parts. Without blackening the onions and the garlic, really let them accrete color beyond translucent before adding anything else to the pot. 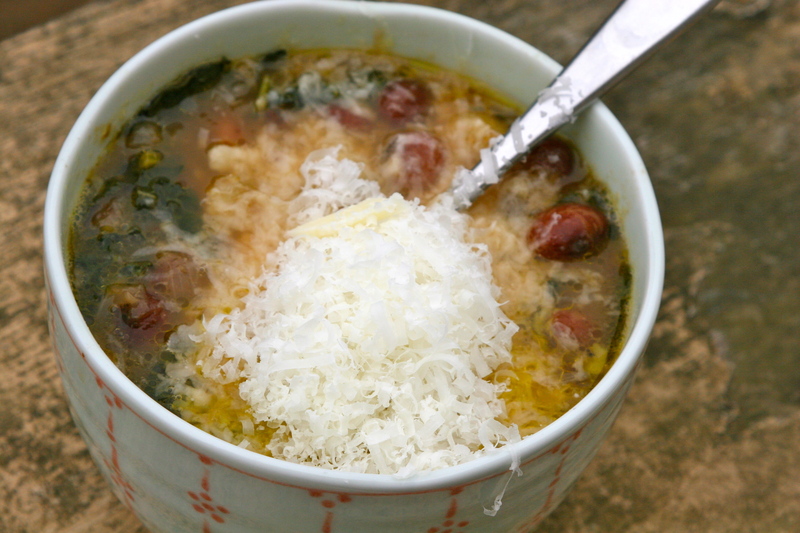 Finally, before you serve the soup, squeeze in a teaspoon of the citrus at a time until it heightens (but does not dominate) the flavor of the soup, drizzle your best olive oil and grate Pecorino Romano cheese in each person’s bowl to serve. Feel free to substitute leeks, shallots, or other onions for the red onion or other fancy cabbages or kales for the lacinato kale. I have done and do do this frequently. Chop your garlic and onion into the size you prefer. Always keep in mind that the finer your chop, the quicker it will cook and less perceptible each piece will be. I go for pretty thin half inch pieces. Cook on medium, stirring frequently for about 10 minutes until the onion is not merely soft, but coloring slightly brown. Add the potatoes and broth. Once boiling, turn the heat down to medium and cook for another 5 minutes. Add the kale and beans and cook until the kale is the softness you desire. Check the saltiness and add a bit of salt, if necessary. Zest and squeeze in the lemon/lime, one teaspoon of juice at a time. You do not want a soup that screams lemon/lime, but rather a heightening of the whole soup’s flavor. Ladle the soup into individual bowls and drizzle a good amount of olive oil into each one and finish with the grated cheese. This entry was posted in Dinner, Kale, Legumes, Lunch, Soup, Uncategorized and tagged bearss lime soup recipe, Kale potato bean soup, Kale potato lemon bean recipe, lacinato kale and bean recipe, meyer lemon soup, Winter Kale Soup. Bookmark the permalink. Bewitching! Not just that you somehow knew I had good kale and was bored with my concoctions, but that I was searching for a soup and didn’t like what I saw. That makes twice you have read my thoughts. You rock mamma! La Cuoca is back! So good to read your words and see your food. We have been eating your belgian waffles for four weeks straight, and I suspect this soup might become another favorite. Welcome back! Ellie, Thanks and it makes me so happy to know that you guys are enjoying the waffles. I have some more new waffle recipes to share if I get around to it! Anna, I hope you enjoy it! Super excited to see another blog post!! Will try this one this weeked – Thanks! Ha! I’m sure I wouldn’t be the first person to do that. For God’s sake there are kale smoothies out there, but I think the point of those is to mask the flavor of kale as opposed to actually enjoying it. So, I happened to have lacinato kale and some meyer lemons from our CSA, as well as some home-cooked cannellini beans, and I made this soup tonight. 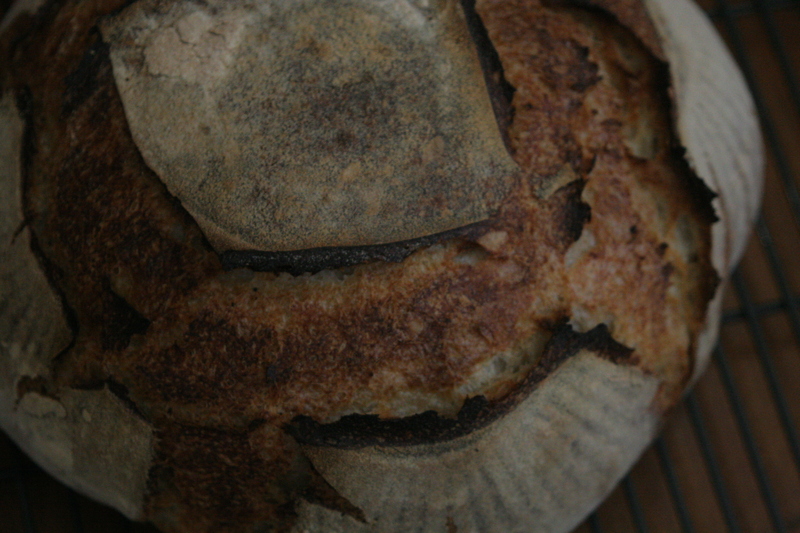 I am sure it would be out-of-this-world with a slice of your homemade bread, but even without that, it was amazing. The lemon really puts the finishing touch. I believe I had about four giant bowls. Thank you! This is my third comment on this recipe, I think…just wanted to let you know that I have now done this recipe times without count, and I adore it. Tonight I happened to have a large handful of dill that was going to rot in my fridge otherwise, and I threw it in towards the end to very nice effect. I think it complemented the lemon well.